4Crests: A baptismal name for “son of Robert” and derived from a Germanic personal name (HROD and BERHT). Following the Norman Conquest the name was occasionally seen in England as well. In Germany the “o” in Robert became a “u” and the “b” was replaced by “p” – Rupert. Ancestry.com: From the Middle Low German word “rupe” which means “caterpillar” and thus a nickname for a gardener. Sometimes spelled Rupp or Ruppe. Internet Surname Database: Rupp (a spelling variation) has been recorded in over seventy spellings (Robert, Robart, Robb, Rupert, Rops, Ruppertz and so on). This source agrees the name “Hrodbeorht” morphed into the Rupe/Rupp/Rupert surname, with “hrod” meaning renown and “beorht” meaning bright or famous. Wikipedia: This is an interesting theory, citing the closest German surname as Ruprecht, which in German was used to describe St. Nicholas’ (Knecht Ruprecht) or Santa’s helper. House of Names: Citing the Germanic name Rupp which was first found in Hamburg, the family gaining a “significant reputation for its contributions to the emerging medieval society.” Spelling variations include Krupp, Krup, Krupe, Crup, Crupp, Crupe, Cruppe, Kroupe, Crop, Cropp, and many more. I’m still working on the Rupe line, its origins and who exactly was the “gateway ancestor” who first immigrated to America. There seems to be a lot of conflicting information as to just who that was, and to complicate matters further, there appears to be more than one Martin or Johann Martin Roop – one in Pennsylvania and one in Shenandoah, Virginia. A Martin Roop of Virginia mentions his son Henry Roop in his will, directing him to care for his mother Margarett. Whether this is my fourth great grandfather is unclear. Henry migrated with several other family members to Gallia County, Ohio, where my third great grandfather David Price Rupe also lived and where my second great grandfather George Washington Rupe was born. David and his family migrated to Sebastian County, Arkansas in 1856 and sided with the Union during the Civil War. Tragically, David was murdered by one or both of his two sons Ransom and Samuel in 1873. Ransom and Samuel, my second great grandfather’s brothers, broke out of jail and Samuel later committed suicide. William Marion Rupe was the son of George Washington Rupe. He married my second great grandmother Mary Ellen Cocherell (or Cockerell) and had two children with her, Maude and Roy. Here’s a little story, oft-repeated in our family and always sure to bring a smile. 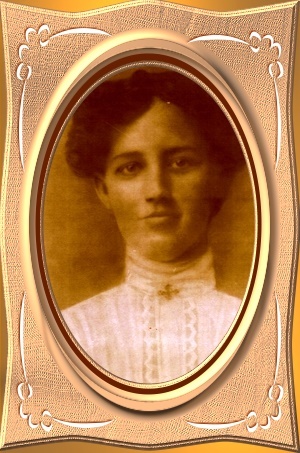 Maude Rupe was born September 11, 1886 in Sebastian County, Arkansas to parents William Marion and Mary Ellen (Cocherell) Rupe. She was a fetching young girl who caught the eye of Roland Daniel Hall, my great grandfather. Roland Daniel was born on November 8, 1880 in neighboring Logan County to parents John Clayton and Kate Hall (John and Kate were first cousins). When Roland and Maude decided to get married, they took a little trip south to Mena, the county seat of Polk County. I’m sure they did that to avoid running into anyone who could attest to the fact that young Maude wasn’t quite yet fourteen years old on April 2, 1900. In fact, she was seven months and nine days short of her fourteenth birthday. Roland, nineteen, was about to marry a thirteen year-old girl. The newlyweds moved to Yell County and on June 25 were enumerated there for the 1900 census. My great grandmother apparently deemed it imprudent to try and fool the federal government — her age was listed as 13. My dad remembers the numerous times that his grandparents sat at their kitchen table, told that story and laughed about it. Now it’s part of our family lore, and even those who never met them have something to remember about our ancestors Roland Daniel Hall and Maude Rupe. NOTE: You are now on the Digging History Magazine site. The Digging History blog has been converted and is being published as a monthly digital magazine (PDF), available by individual purchase or subscription and emailed each month to your inbox. The magazine is packed with informative articles focusing on history and genealogy, colorful graphics and between 60-75 pages in length with a comfortable reading font. NOTE: Check the “Special Offers” page for contests, giveaways and discount codes. Magazine samples (a few selected pages) are also available. Want to try a full issue? Find the “Subscribe to Blog Via Email” section (at the bottom of all pages). Provide your email and become a follower and look for a free issue in your inbox.